Winter break is coming up. Going to the land of sun and fun? 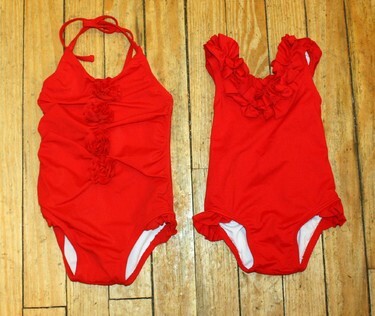 Your little one is gonna be needing a swimsuit! We've got lots to choose from, so come in for a sneak peak of summer. We have plenty of others in stock, too! If you don't see them out on the floor, just ask, and we will be happy to bring out the bin of them for you to go through. One piece on left, 18mo. Two piece on right, size 5. Top: Ralph Lauren, size 9mo. Bottom: Bella Bliss, size 3. Top: Ralph Lauren, size 12mo. 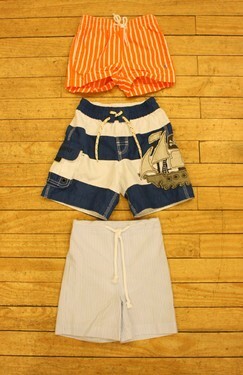 Middle: Petit Bateau, size 12mo. Bottom: Ralph Lauren, size 12mo. 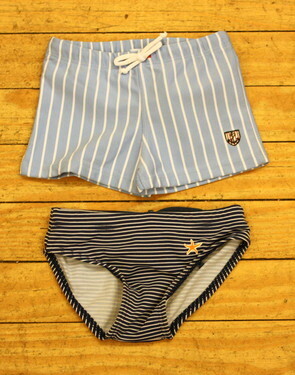 Swim trunks with a little more European appeal. Blue trunks on top by Jacadi, size 23mo. Bottom by Flotsam & Jetsam, newborn size. Red, shark print trunks by Charlie Rocket, size 6-9mo. 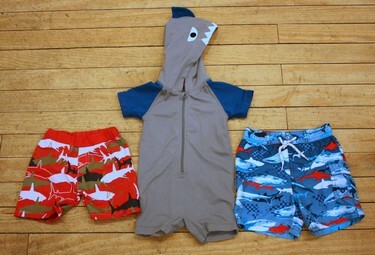 Shark bodysuit by Gap, size 6-12mo. Blue, shark print trunks by Greendog, size 12mo. A lone pair of Vilebrequin swim trunks. These guys always sell out fast!